Seasonal. | Eat More Plants. My garden is really in its prime right now. I made two beautiful salads for dinner tonight. One, a purple tomato and feta salad with balsamic and raw shaved carrots. 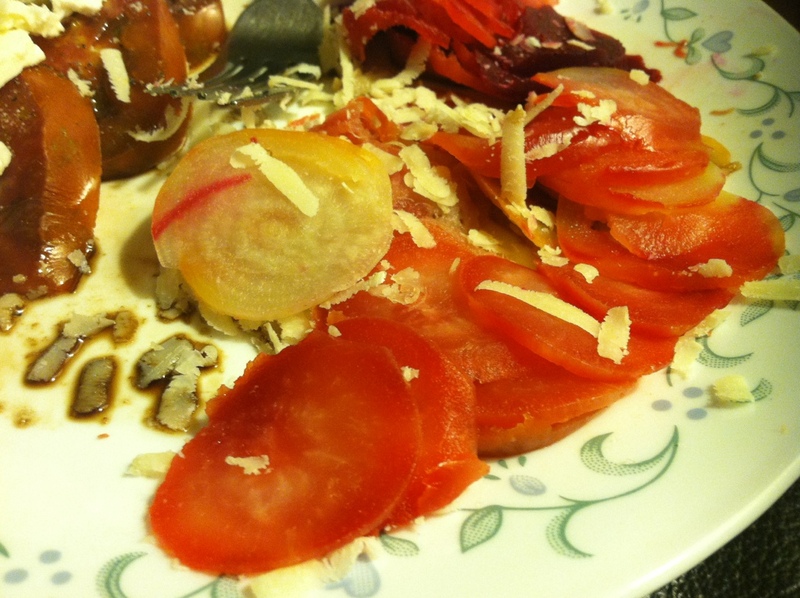 The second was roasted beets sliced thin with pink salt and parmesan cheese. Sadly I pulled up the last of my beets today. Next year I will plant a late summer crop so I can enjoy my beets later into autumn. The purple tomatoes have a really rich and savory flavor. Extremely nice textured flesh also. Not mealy at all and just the right softness. The way tomatoes are bred nowadays is to have a very red color but by doing that they take the flavor out. An example of these tomatoes are probably the tomatoes they put on your hero at a deli. Bright red but no flavor. That’s why heirloom tomatoes are so great. They’ve never been genetically modified or bred with something else. I’m really impressed by how well all the different kinds of tomatoes are producing! I had a dream last night that my hair was a really dark brown, purple tinted color. I might need to dye it as soon as my tan fades. My hair got so light and red from the summer sun. Unbelievable! I haven’t seen my hair this naturally light in at least 15 years.